While we do have a huuuugggeee upstairs with a living room as well, we are hoping to eventually have two bedrooms upstairs OR a giant master bedroom. While we aren't going to be tackling all of this at once (obviously) it's a good project to work on in bits & pieces. We are moving into a pretty move-in-ready house which I am happy about. I feel like the past 6 years have been a weird state of extended transition. From moving around in college to not being able to settle down in our apartment in Williamsburg to moving up to Michigan in July & then eventually on to Indiana by the end of the month I am ready to nail my belongings to the ground! I just want to settle down! But an opportunity to make a house our home is exciting. 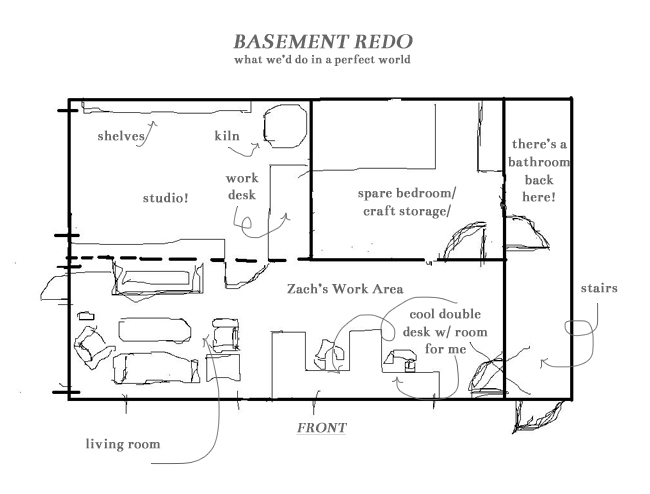 Zach has a few bookshelves, nice dark brown coffee table, & a suede-ish couch and recliner. I have a few bright red/orange pillows that I'm determined to sneak in there. We need to add some baskets for storage & a throw to keep us warm. This will be our main room for entertaining so we are going to eventually add a bit more seating room, some more side tables. Zach's large flat screen will sit in front of everything. The only thing I ended up contributing to this was a design tidbit from the Nate Berkus show! Having such a long room like that, Nate Berkus said to create zones to break up the bowling alley look. So we are going to probably do some sort of separater, whether it be shelves or what not between the desk area & the living area. Zach needs a lot of space to tinker around so his part of this cool shaped desk will be super long & I'll just need it to sit & design. I feel like I'm going to be all around this house! Dabbling in a lot of different things means a lotta different spaces but I hope to be spending a load of time in with my wheel & kiln. I can't wait to seriously kick that off! So that is a little insight into what we're thinking as we move a little closer to the closing date. We're still working out bugs but we hope to be in there by the end of the month! Do you have any dream redos for your space?